Following an outstanding season highlighted by victory in the Country Championships Final at Royal Randwick in April, Victorem has been crowned the 2017-18 Mid North Coast Racing Association Horse of the Year. The Jenny Graham-trained three-year-old gelding raced on four occasions during the season for three wins and a second while earning stakes money of over $420,000 with associated BOBS Bonuses taking the figure to around $476,000. The son of I Am Invincible commenced his campaign with success at Randwick in Class 3 Highway company during December before accounting for stablemates, Awesome Pluck and Portatorio to qualify for the Country Championships pinnacle at Port Macquarie in February. The comprehensive win against the cream of NSW country racing’s finest in the $500,000 Newhaven Park Country Championships Final at Randwick provided Jenny Graham and her hard-working team their biggest thrill in racing as Victorem sailed away from Don’t Give a Damn and O’ So Hazy to score by over two lengths. 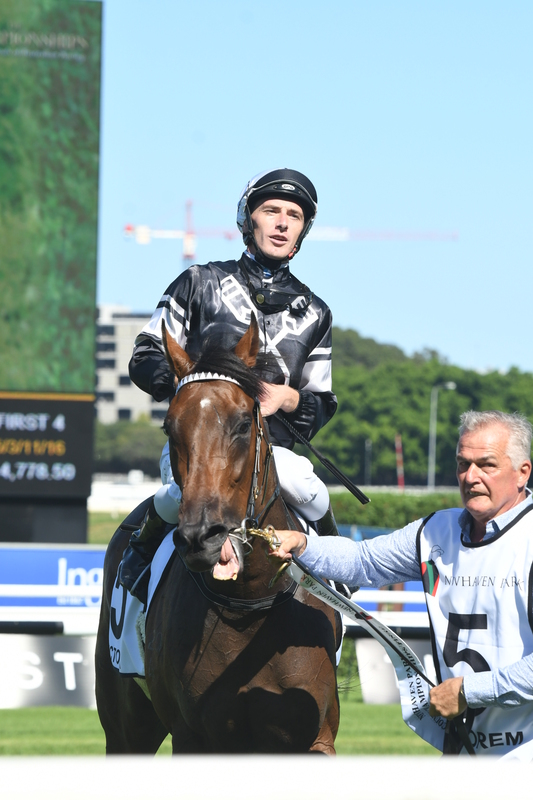 The season concluded with a luckless second to Sambro in the Group 3 Hawkesbury Guineas with these performances leaving little doubt the gelding would be named the association’s premier galloper and a wonderful future is assured for the Port Macquarie-trained star. Despite being relegated to the sidelines following a shocking fall on It’s Relative during the July carnival at Grafton, Ben Looker earned the title of jockey of the year with 33 wins on the mid-north coast. As well as the thrill of being associated with Victorem, Looker completed the overall season with a remarkable success rate of 91 wins and 182 placings and finished second in the NSW country premiership behind champion rider, Greg Ryan. All in racing wish the popular jockey a speedy recovery together with a continuation of the outstanding form which has resulted in the statistics achieved over the preceding 12 months. Kris Lees has been a wonderful supporter of north coast racing and has thoroughly deserved the title of local trainer for the season with 42 wins and has again achieved the mantle of premier NSW country mentor. Lees scored a record of 86 victories and over 142 placings to account for Brett Cavanough in the country series and outstanding overall figures resulting in the Newcastle trainer finishing third in season statistics behind Chris Waller and James Cummings. It has also been a wonderful riding year for stable jockey, Louise Day, who deserved the Mid North Coast Racing Association apprentice of the year title with 23 victories. The 23-year-old from Ireland has enjoyed great success since linking up with the Kris Lees stable and finished third behind Patrick Scorse and Cejay Graham when the curtain came down on the apprentice season with 36 wins and 67 placings resulting in a strike rate of 12.80%. The presentation of awards will be hosted by Manning Valley Race Club at their Taree race meeting on Friday 17th August which features the running of the Hopkins Livermore Cup. This race perpetuates the memory of two outstanding administrators of mid north coast racing in Don Hopkins and Ivan Livermore with their contribution to racing in the district to live on for the future. The next meeting to be conducted by the Port Macquarie race Club is the Camden Haven Cup race day on 25th August and the recent break from racing at the circuit should ensure the course is in the best possible shape prior to the commencement of the local carnival. Then the stage is sent for an outstanding festival of racing, commencing with Stowe Australia Cup Prelude on September 23rd prior to the Carlton Draught Port Macquarie Cup carnival in October featuring top prizemoney and the very best the industry has to offer.